As directors of Factory 49, myself, Pam Aitken and Marlene Sarroff had a group show in the Factory 49 Office Space that we called the 'Directors Show'. 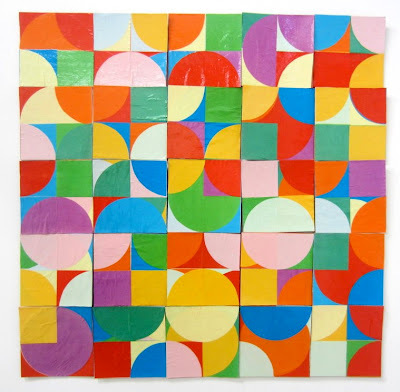 I exhibited a cardboard and paper work that was based on the circle square paintings that I had been doing. It consisted of 25 pieces that when hung together recreated the random patterning of the square and circle painted stencil patterns. CLICK HERE to go to a copy of the exhibition catalogue.